They're not just for Vegas anymore. 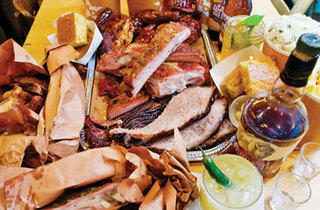 We love Hill Country on a normal night, so imagine our gluttonous delight at the chance to fill up on endless 'cue. Tell your server you want the deal, and you'll get a wristband that signifies you're ready to gorge. 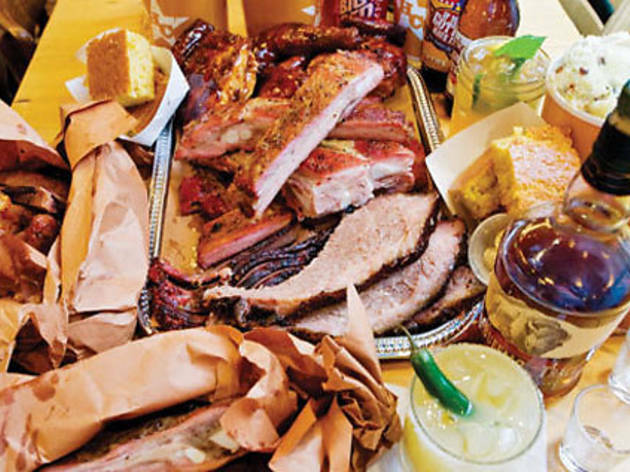 Included in the special are smoked brisket, gargantuan pork ribs, dripping barbecued chicken and as many sides as you want (mac and cheese, red chili and baked beans cost an extra $2, but the gratis chipotle deviled eggs, bourbon-sweet potato mash and white-corn pudding suited us just fine). Unlike the regular Hill Country self-serve setup, the waiter brings the food to you. Caveat emptor: To cash in on this sweet deal, everyone at the table has to be in on it. 30 W 26th St between Sixth Ave and Broadway (212-255-4544). 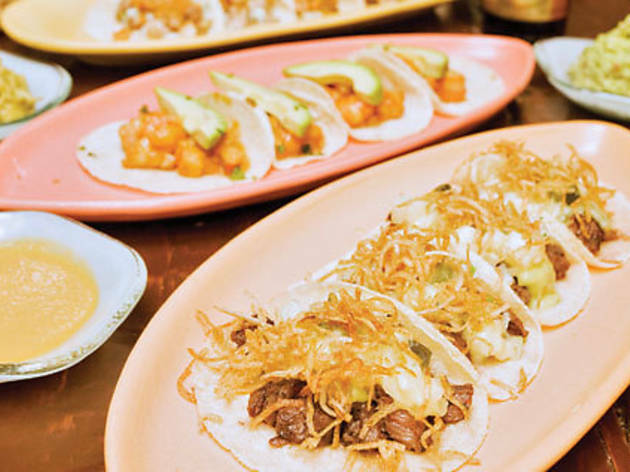 Get your fill of some the most authentic tacos in the city while watching a movie (this week it's Office Space), sipping $5 margaritas and gratis Dos Equis beer at this Mexican roadhouse's weekly gorgefest. Once the show begins, any of the seven tacos from Cabrito's regular menu are fair game—we dug into tortillas stuffed with spicy tongue and house-made chorizo. 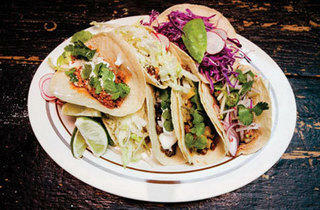 The orders come out hot, fast and, to ensure freshness, only two pairs of tacos at a time. We recommend arriving early enough to grab a seat at the bar for the best sight lines. 50 Carmine St between Bedford and Bleecker Sts (212-929-5050). 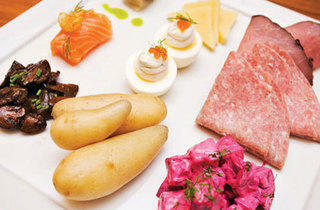 The Sunday brunch at Aquavit is one of the city's classier buffet meals. 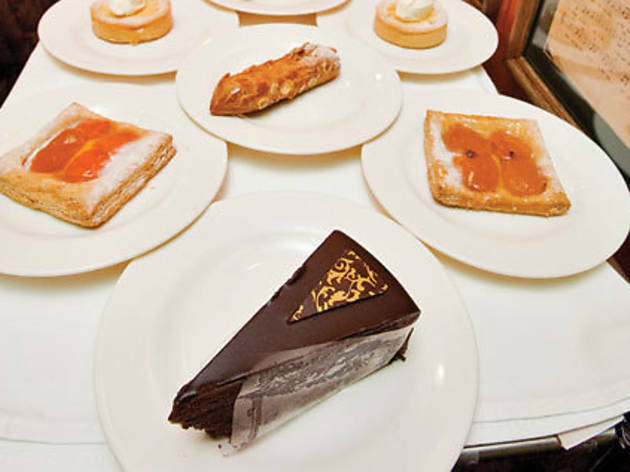 The striking Scandinavian spread includes more than three dozen attractively plated specialties—salads, seafood, hot dishes, meats, cheeses and more. 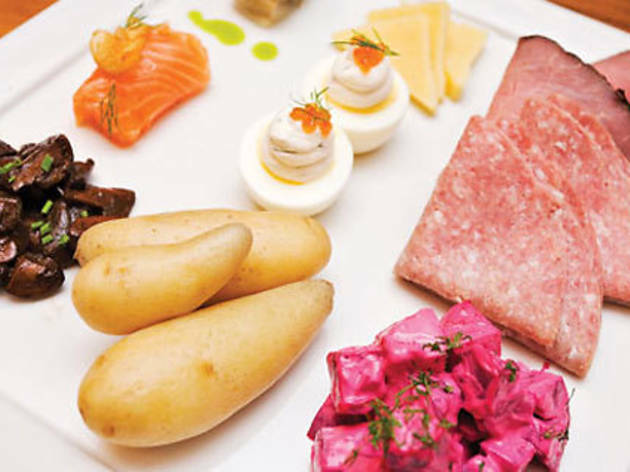 We favored the vodka-lime pickled herring, creamy beet salad, thinly sliced cured salmon and tiny breakfast sausages called prinskorvars. Also part of the deal: Carlsberg beer or a Danish Mary made with Karlsson's Gold vodka. Save room to sample the teeny ramekin of ris a la Malta, a Swedish rice pudding. 65 E 55th St between Madison and Park Aves (212-307-7311). We waited 15 minutes before we could snag a table for the popular lunch at this casual Curry Hill restaurant. 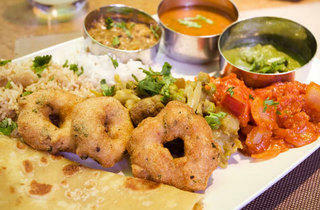 Thanks to the heavy turnover, the Indian vegetarian staples simmering in the steam trays were ultra fresh. We filled our plate (and some charming traditional metal bowls) with the creamy chana saag (chickpeas with spinach) and tomato-rich kadhai paneer masala (vegetables and cheese). 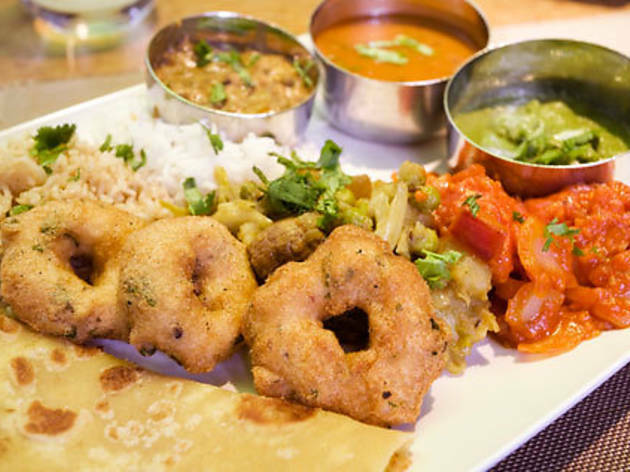 Hot chapati (flatbread), fluffy basmati rice and savory medu vada (fried lentil doughnuts) were ideal for sopping it all up. 127 E 28th St between Park and Lexington Aves (212-685-7301). It's hard not to overdo it on fried chicken when it's prepared as well as chef-owner Charles Gabriel's—cooked in a cast-iron skillet until the skin is a crispy shell and replenished in the buffet at a nice, steady clip. 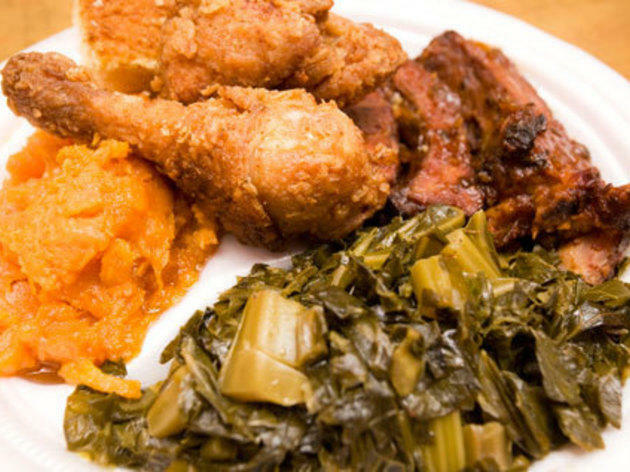 Though there's much more to sample at this proper hole-in-the-wall, such as serviceable sides—including yams and collards—and heaps of other meats, like smoked turkey wings, the fried chicken outshines them all. Drink as much sweet tea as you like, but skip the store-bought-tasting layer cakes for dessert. 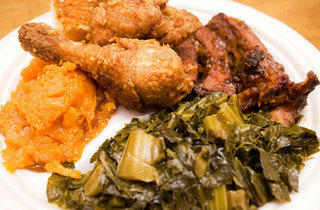 2841 Frederick Douglass Blvd (Eighth Ave) between 151st and 152nd Sts (212-281-1800). Usually when we're at an Irish pub, we're drinking till we can't drink anymore. But at this homey FiDi pub, our goal was to eat until we say uncle. 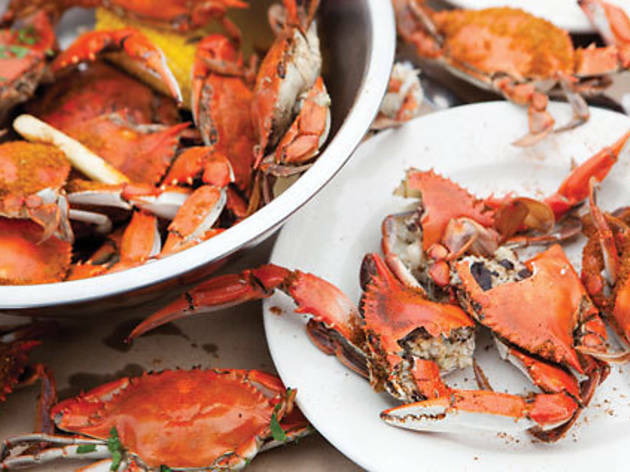 To describe the selection as varied would be an understatement—we blithely skipped from succulent corned beef to roasted brussels sprouts, on to fresh-made waffles and raw oysters and clams. It's not all good (steer clear of the desiccated eggs Benedict) but enough of it is to make this worth the price of entry. Did we mention a free Guinness is included in the deal? 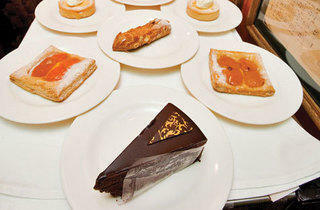 95 Pearl St between Broad St and Hanover Sq (212-482-0400). 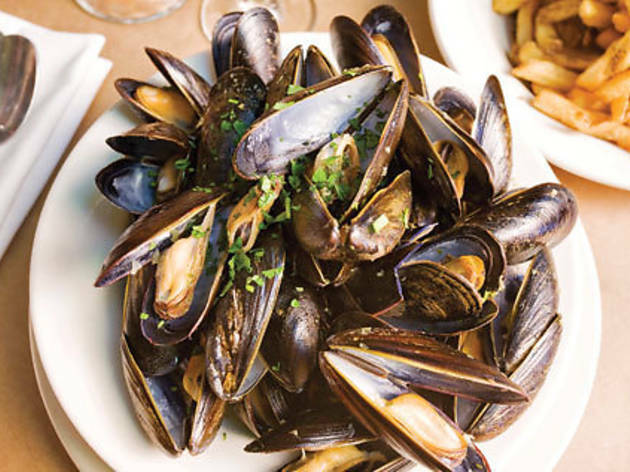 What better way to spend a mellow Tuesday evening than at a low-lit French bistro where polite waiters bring endless bowls of perfectly cooked mussels until we cried non plus? 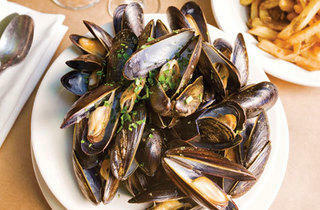 Diners have a choice between the garlic marinires with white wine and shallots, or the creamy moules la moutarde with a mustardy broth and crme frache; both come with a plate of golden fries. We were pleased to find that ordering a second and third round was quick and easy, and while the supply of frites isn't endless, we didn't particularly need more. Enjoyed up with a bottle of Chteau La Morinire muscadet ($24), it's an ideal meal. 211 DeKalb Ave at Adelphi St, Fort Greene, Brooklyn, 718-852-6250. Usually we'd be skeptical about an all-you-can-eat sushi deal. 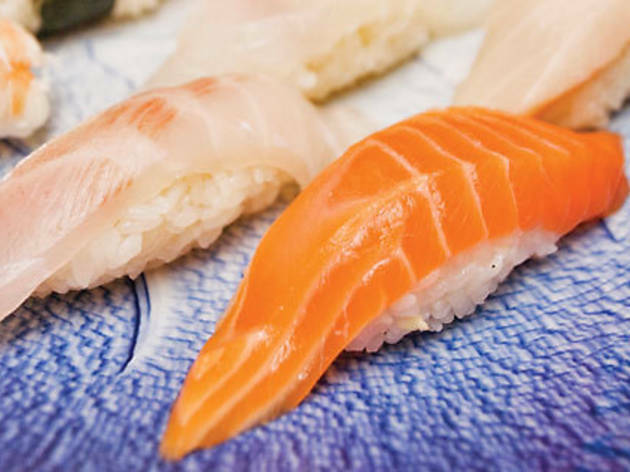 But most of the rolls and nigiri on the regular menu at this sleek West Village sushi den are included in this steal, and the stuff is fresh and good, so how could we go wrong? 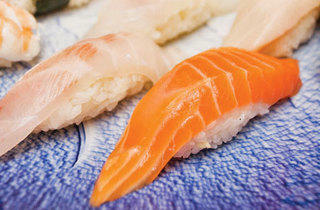 The giant slabs of quality salmon and eel and the crunchy yellowtail roll should suit any sushi nonsnob. Sounds too good to be true? Well, it kind of is: Overorder, and the place will charge you $3 for every piece of sushi left on your plate. Sounds a bit like a scam, but at least they let us know up front. 24 Greenwich Ave at 10th St (212-989-2500). All the tacos you can eat and $5 Dos Equis? We're there. 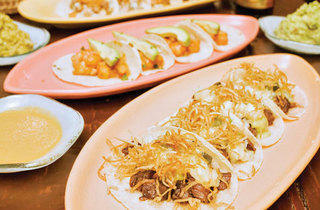 It doesn't hurt that Mercadito happens to be among the best Mexican restaurants in the city. 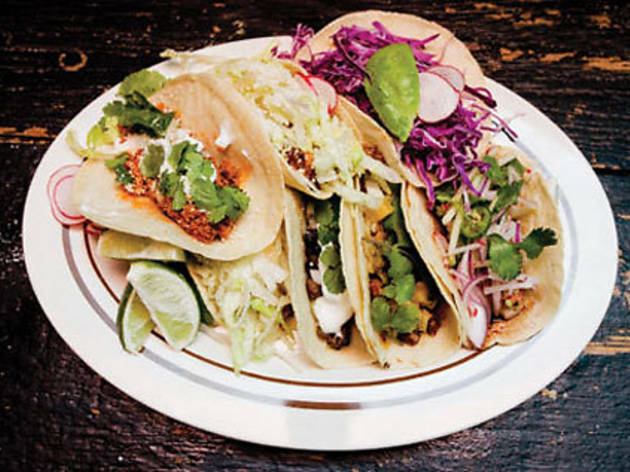 It's open season on any of the excellent tacos for these of face-stuffing sessions, and they come four to an order (sides of fluffy Spanish rice and refried beans are included—not that you'll need any extra padding, the tacos come hot and quick). The fillings we recommend: roasted pork with bits of pineapple, tender rosemary-marinated steak, and herb chicken with Manchego chips. These tiny places becomes packed well before the special starts, so getting there early is key. 100 Seventh Ave South at Grove St (212-647-0830) * 179 Ave B between 11th and 12th Sts (212-529-6493).